The name itself beckons an instant stream of adjectives. Earthquake. Poor. Dirty. Beautiful. Rich. Majestic. Not to be forgotten are the litany of nouns as well. Home. Family. Hope. Faith. Bill Clinton? Still, we can agree that our opinions and associations of Haiti are a matter of perception and perspective; with the latter being influenced by the former. I remember when I used to be at the mercy of media portrayals and kids in elementary school who hurled racial epithets like dodge balls in gym class. "Haitian booty scratcher" and "banana boat" were the most popular of those ethnic slurs. The initial shock was, admittedly, crippling but I knew that my family (and many other Haitians) did not fit those descriptions. Although I was born in America, I was raised to embrace and appreciate the nuances of my culture; which was a far cry from its supposed barbaric, primitiveness. More than a decade later, I would visit the land of my heritage for the first time. The following explores my second visit back "home" within two years. So, here are my two cents. Six years have elapsed since an earthquake uprooted Haiti’s capital of Port-au-Prince. Unfortunately, not much has been done to repair the damage caused by the quake. The reasons follow a vicious cycle of misused relief aid (some billions of dollars pledged never made it into the country), a lack of organization and a “fend for yourself’ attitude prevalent among the inhabitants. As we drove from the airport, I observed a scene from the backseat that played like a looped video clip. Unpaved roads inundated with refuse, street vendors waltzing amongst the flow of traffic, and people decorating storefronts in deep thought; as beads of sweat congregated their foreheads in protest to the sun’s presence. It’s a sobering reality, especially when you know that this part of the country does not capture its essence as a whole. Our car ride led us to Wahoo Bay Beach Resort; located along Haiti’s western shoreline in the town of Carries. Granted, I’ve been to resorts in other Caribbean islands but this would be a first for me here in my mother’s land. 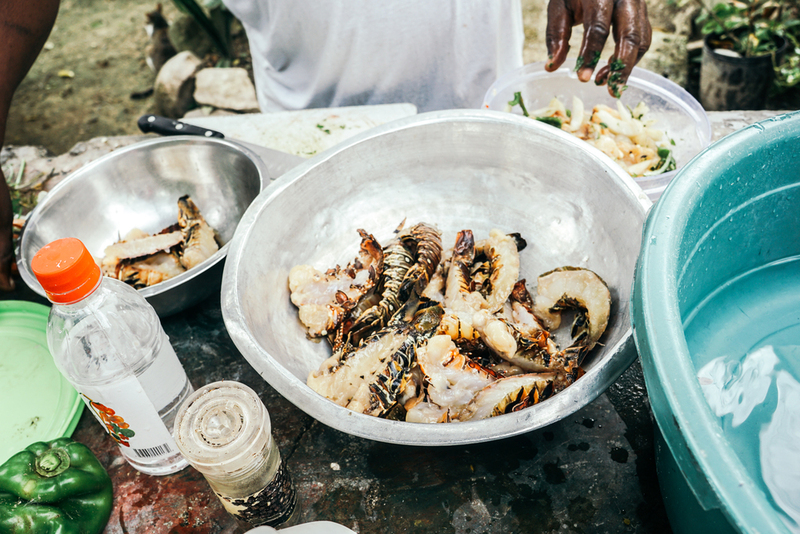 The waters were transparent, the palms swayed with a mesmerizing nonchalance and the food was everything I love about Haitian food. The medley of spices and sauces commonplace in the cuisine were authentic; not compromised for the taste buds of tourists. Here was where I saw a glimpse of what could be a booming industry for Haiti. Wahoo Bay isn’t the only resort. In fact, there are similar locations sprouting around the country. With the right infrastructure and hopefully an all-inclusive resort on the horizon, Haiti could attract more tourism to boost their struggling economy. The resort was a nice getaway from reality for the first few days but I primarily come here to spend time with my in-laws and extended family. I hope those of you who have seen photos of my wife are not saying to yourself, “Oh! She’s Haitian too?” I’d be thoroughly disappointed. Anyway, my in-laws reside in the south; in the small town of Fond des Blancs. Nestled amongst the mountains, Fond des Blancs is a stark departure from the country’s stifling metropolis. The route is a snail’s journey because of the jagged road littered with rocks; scattered debris from a carved mountainside. Navigation is best described as videogame-esq. Just think of playing Mario Kart in real life. Outside the confines of the vehicle were passing motorists (the Ubers of Haiti) chauffeuring residents to and from locations. Also sighted were cattle and goats trotting in front of their herders as well as people riding atop donkeys. The serene landscapes and the liveliness on the road entertained us for a time. Then came the petulant, “Are we there yet?” complaints from Sara and myself. I mean, it took an hour and a half to drive 12 miles (20 KM). In Fond des Blancs, life is very, very rural. Roosters crow incessantly at the break of dawn. Freshly baked bread from the local bakery is prepared during the wee hours of the morning. And the dirt roads silently await the comely feet of passersby. My circadian rhythms weren’t impervious to the sun’s commanding presence; so I found myself up at 6 AM on average. With the days beginning with so much potential, we did well to make the best use of our time. This included galavanting around the land surrounding the house. Directly outback was fresh vegetation; either to be eaten from its branches or to be used as an ingredient for dinner later that evening. The livestock on the grounds also play a major part in day to day sustenance for the locals. I’m talking about real life farm to table. Cage-free, organic and all that jazz sans the Wholefoods co-sign. We even got to observe the bakers at work in their boulangerie. 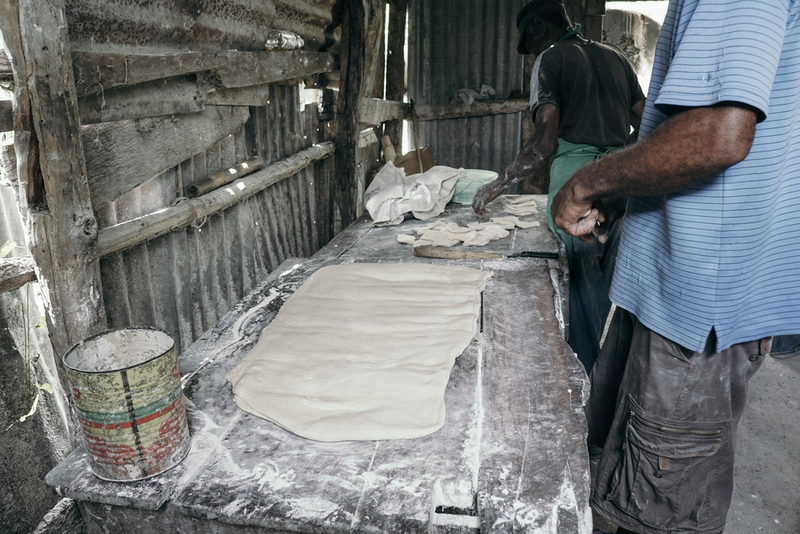 The structure and the materials used for the bread making process were all built by hand. A true testament to the ingenuity and innovativeness of the people. On our final evening in Fond des Blanc, my father-in-law flexed his culinary muscles and orchestrated a salivating surf and turf dinner. 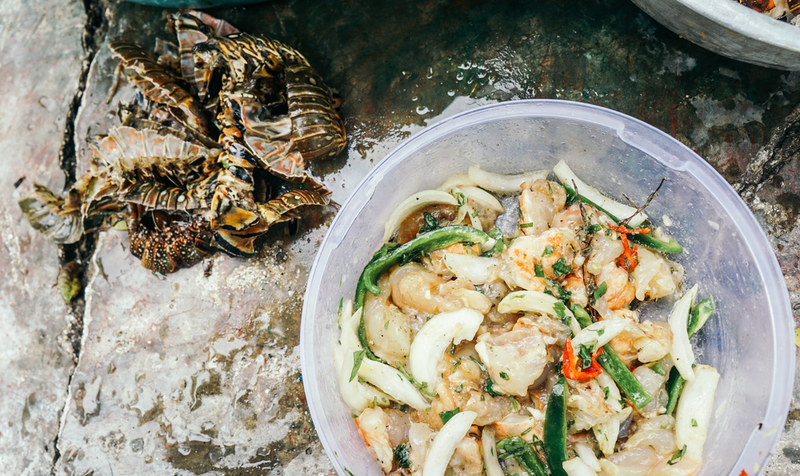 The arrangement of grilled lobster tails and lobster stew created the perfect harmony when paired with dishes of rice, macaroni, and bbq goat meat. Sara was on hand to document the process, while I waited patiently impatient to commence the face-stuffing. *Disclaimer: All the food was devoured before we could snap a photo of the complete spread. This is one of those “you had to be there to see it/eat it” stories. 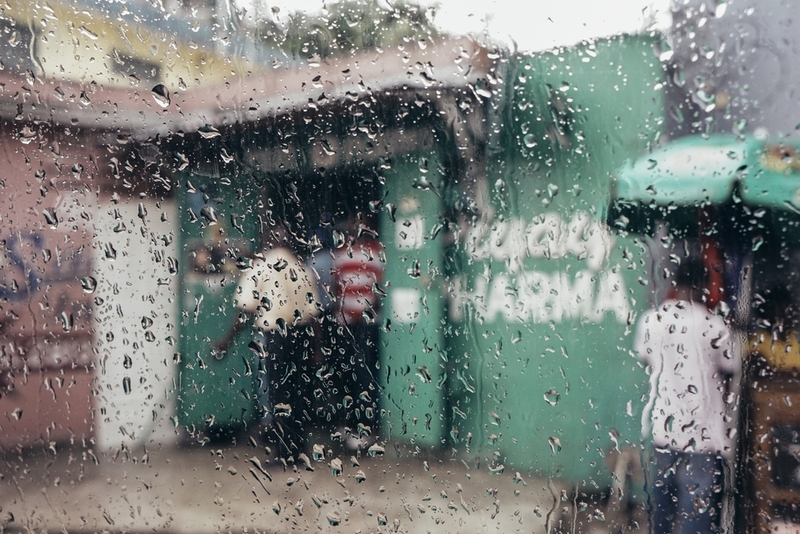 Our finals days in Haiti were marked by more driving and intermittent rainfall. Of course, we decided to travel here during the rainy season. Tickets were super cheap so...yea. Nevertheless, most of my favorite captures were taken through the droplet-ridden window of our vehicle. Life either slows down or hastens during a downpour. I witnessed people dashing for shelter while others defeatedly walked through the storm. There was something poetic about it all. Eventually, it was time for us to return to New York. Before we boarded the plane we made sure to stock up on duty-free Barbancourt Rhum. This sentence is in no way #sponsored by the aforementioned but if you’re into rum, I strongly suggest you try it. But on a more somber note, as I settled into my seat, eyes peeled onto the runway tarmac, I reflected on my time in Haiti. It’s the most fitting adjective when I think about the land of my inheritance. The beauty that I see in Haiti is scoffed at by the older generations who speak with bittersweet nostalgia about the good ‘ol days back home. Life was much simpler before the rampant political corruption which weakened the country’s economy. The U.N’s occupation of the land is also telling of how Haiti’s natural resources have been divvied up by various world powers. At this point, It’s hard to imagine that its infrastructure is capable of repair. Beyond those heavy, layered complexities are the Haitian people as a whole. The resilience, the love, the pride, are tightly woven threads that have kept the fabric of the population intact. All of their struggles told through astonishing artwork, charismatic storytelling, and riveting rhythms. 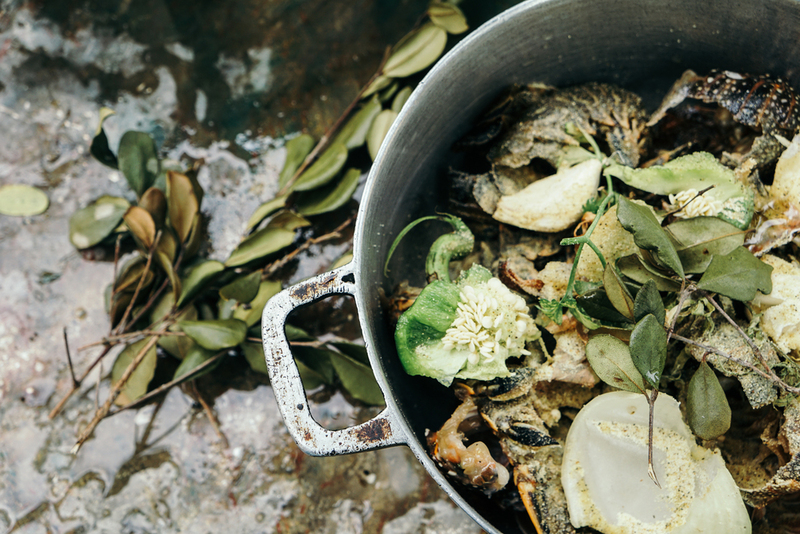 Engaging my senses to experience a fraction of the accounts my mother related to me at our kitchen table, solidified the intrinsic bond that I have with Haiti. I’ll never cease to tell of its wonder.